So for our anniversary we decided to head up to the north bay for the day to try some new places since we hardly ever go there. We were looking for good places to eat and I stumbled across this pizza place in Larkspur called Pizzeria Picco. Apparently Iron Chef America, Mario Batali, said it’s the best pizza he’s had in America. How can you not try it?!? Also they make their own soft serve using cream from Stauss Creamery. If you’ve never had their milk, head on down to Anthony’s Cookies and grab yourself a bottle. It’s super rich and thick. Anyhow, that combo of things sold us and off we were to wine country. The restaurant is a small little restaurant situated a couple blocks from downtown Larkspur. There are about 7-8 tables outside and then a full restaurant inside. Since it was a nice day we opted for outside seating. As we were waiting we noticed everyone had a margherita pizza so obviously we had to get one of those too. 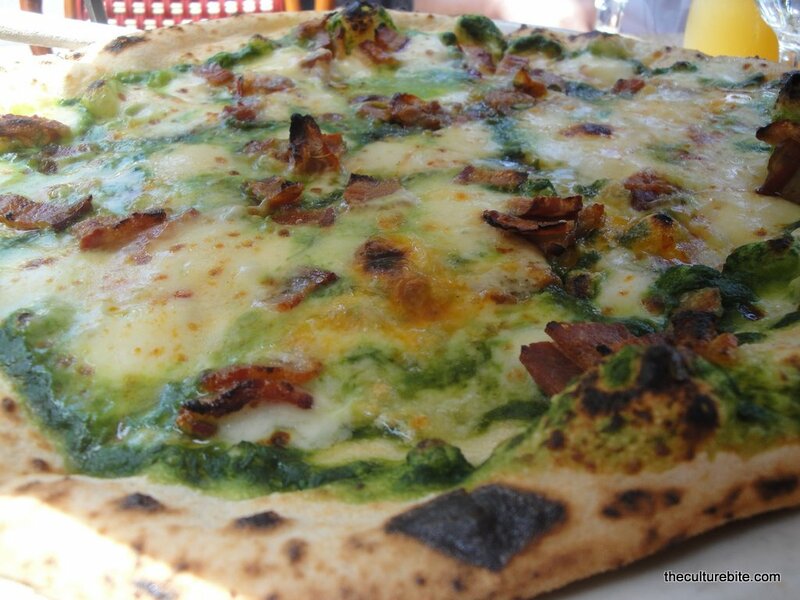 We also ordered the special of the day which was a pesto pizza with mozzarella, fontina, red chiles, and bacon!! How wonderful does that sound? Here’s their menu so you can take a gander. If you ever get to try one of these you should do so. We both had a craving for Orangina but this is way better. It must be the glass bottle. 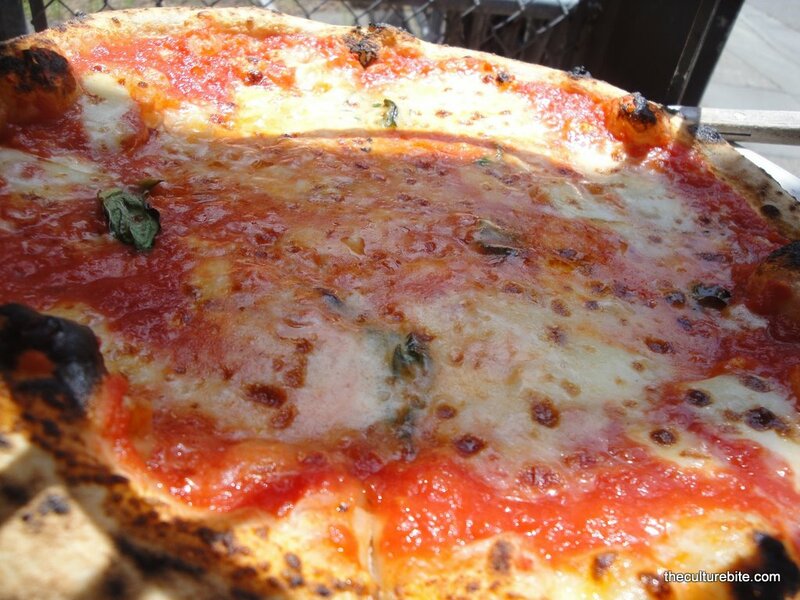 The margherita was one of the best I’ve ever had. The crust was slightly charred to give it that rustic brick oven taste. The edges were crispy and the middle was soft and chewy. The cheese was light and not overwhelming. The sauce was tangy and not over abundant. The only drawback was that there was only a small amount of basil on the pizza. When I order a margherita, I like to have a lot of basil on it just for flavor, but all in all, this was a darn good pizza. At first I wanted to say it was better than Tony’s Nepolitana or Delfina but to be honest I would have to have them side by side for me to say one was better than the other. Just know…it ranks really high in my opinion. The special of the day. Man when I saw this pizza I knew we picked a winner. Just look at those hunks of bacon on it! How can you not love anything with bacon? My first bite of this pizza put a huge smile on my face. The pesto was not a typical basil pesto. I am not sure what herb they used for it but it was distinctly different than basil which gave it a nice unique twist. The bacon, of course, was a nice touch. It was thick and meaty and complimented the pesto perfectly. The best part of the pizza? The chili’s. This aspect gave the pizza a nice spicy kick to make this a supreme pizza. As much as we wanted to devour our pizzas, of course we had to make sure we had enough room for the soft serve. 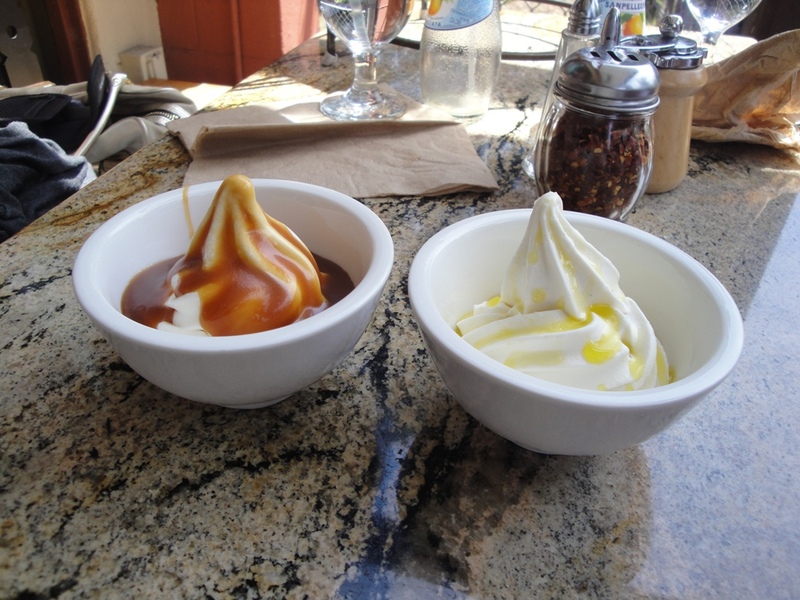 The soft serve on the left is vanilla with dark caramel sauce. This was really tasty. As weird as this sounds, the caramel tasted like those caramel squares you get at the grocery store. It was really thick and sweet and had a very strong caramel taste. Yum!! The soft serve on the right is vanilla with….olive oil and sea salt?!?!? Before coming here, I read a lot of reviews on Yelp and a lot of people tried this and had mixed reviews. When our server asked us if we wanted dessert, I asked her what people thought of the sea salt and olive oil. She said it’s weird but 99% of the people who tried it liked it. So, being the curious person I am, I opted to get it. She explained that it was similar to kettle corn in that there is a balance of sweet and salty and you know what, she was right. The first bite takes you by surprise because you don’t know how salty it is going to be and how much of an olive oil taste there is. They use a very good olive oil on this and it shows. The sea salt is coarsely ground so it adds a little crunch to the soft serve. I know I am not doing it justice with my words but all I can say is that it’s worth trying once. 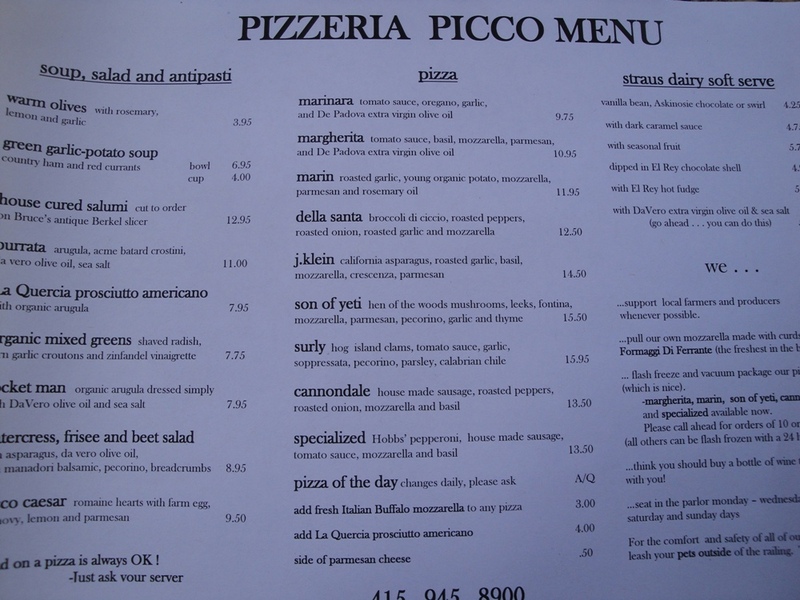 So how would I rate Pizzeria Picco? It’s a really good pizza and it’s even better if you go on a day where the pizza of the day rocks like ours did. The pizza survives the “cold test” which is that it’s just as good eaten cold out of the fridge the next day as it is freshly hot. And no matter how much you eat, you gotta save room for the soft serve. But wait… our day didn’t end there. After lunch we headed up to Calistoga for a spa day. I’m not into massages or anything so we ended up going to this mineral bath place. I got this volcanic ash bath which was very helpful since I ran the Bay to Breakers in the morning. After the spa we had worked up our appetites again and headed off to dinner in St. Helena. We were looking for a nice restaurant in the area but we weren’t ready to break the bank at French Laundry or anything of that caliber. After looking at several Michelin rated restaurants, we decided on Terra. The restaurant is very unique in that it is split in half. When you walk in the front door there is a staircase. If you go to the right there is another door and it leads to the main dining room. If you go to the left, there is another door and it leads to the secondary dining room. When we got there, we were the only people in the restaurant. I was a bit skeptical and even made a joke to the maitre d’ about it. He said that they just opened and didn’t seem amused by my joke. I just said that maybe we’ll get extra super good service. Eventually after about 10 minutes or so the restaurant started to fill up. 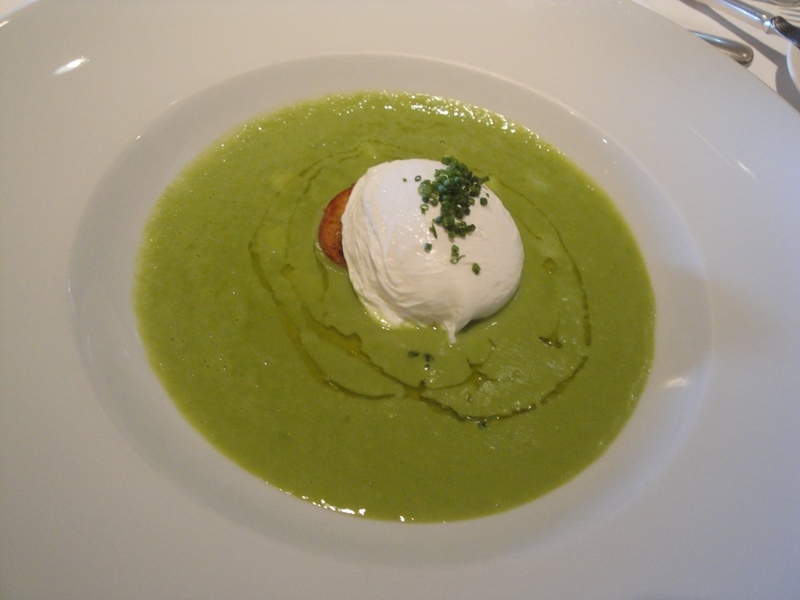 So to start off we got the cream of delta asparagus soup with poached lily’s egg and garlic crouton. The soup was really tasty. It wasn’t a complete puree and it had little chunks of asparagus in it. The poached egg was a nice touch and the yolk mixed with the soup made it more rich. The white of the egg was chewy and mixed with the crouton, it gave the soup extra texture. Our other appetizer was the ravioli of dungeness crab in cioppino sauce with crab back rouille. This dish was really good. The crab in the ravioli tasted extremely fresh. The meat was tender and the raviolis were cooked to a perfect doneness. The cioppino sauce gave the dish a nice seafood taste and it wasn’t just a basic tomato sauce. 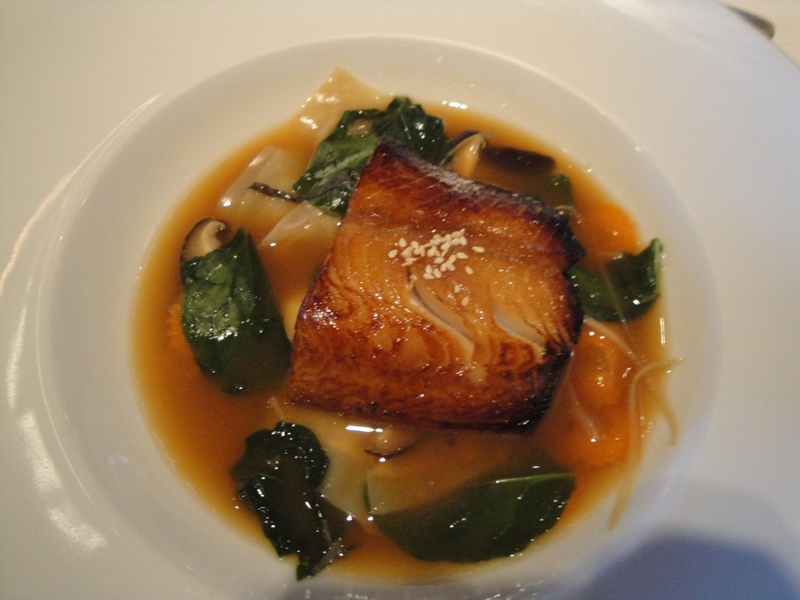 Main dish 1 – broiled sake marinated Alaskan black cod and shrimp dumplings in shiso broth. So for our wedding banquet we had a honey glazed Chilean sea bass which was so good but we didn’t get to eat any that night. We have been meaning to go back to Yank Sing to order it but we haven’t gotten around to it. This entree came pretty darn close. The cod was so buttery and light. It was fork tender and melted in your mouth. It had the perfect blend of sweetness and saltiness to balance out the fish and the shrimp dumplings just made the dish that much better. 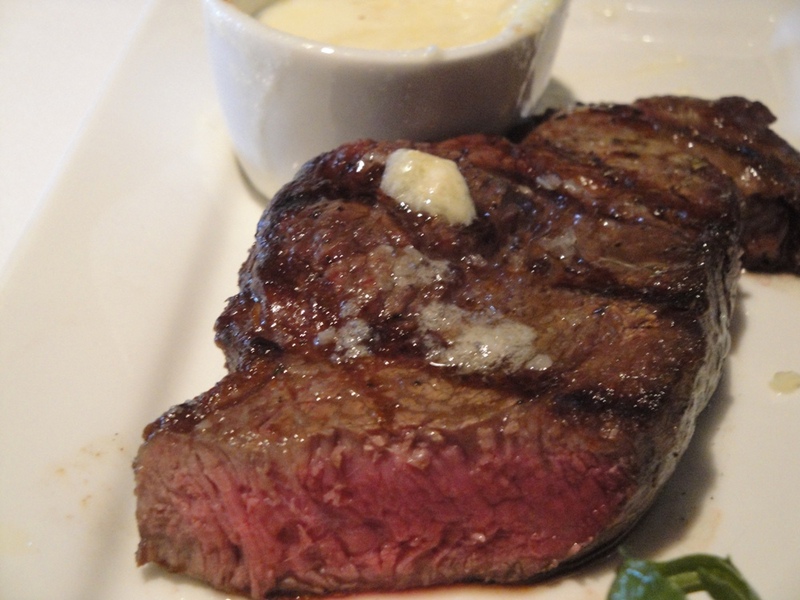 How good can a steak be? Well, the Grilled dry-aged New York Strip steak with Red Hawk Cheese and Bone Marrow gratin potatoes sure showed me. This was one of the greatest steaks I have ever eaten. It didn’t need to be cooked in butter like Ruth’s Chris. It didn’t need any sauce or seasonings. It was a perfectly done steak. There was slight salt and cracked pepper on top but other than that it was one of the most flavorful steaks I have ever eaten. It was super tender and juicy. My mouth is watering just writing about it now. The potatoes were really good too. The cheese sauce wasn’t super thick or rich but was still flavorful nonetheless. It made it feel a lot lighter than it probably was. 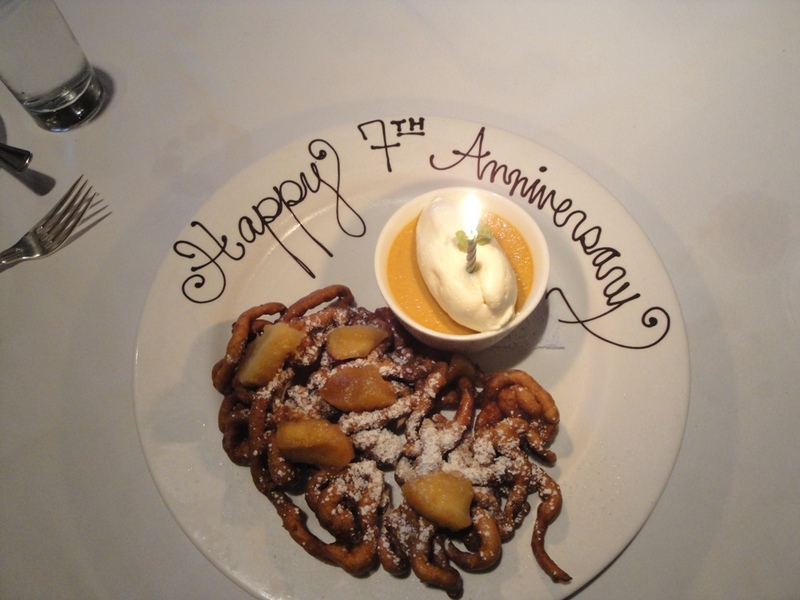 This bizarre looking dessert is actually a butterscotch pot de creme with an apple funnel cake! Wouldn’t that make you want to go there? The funnel cake was anything but the kind that you get at a carnival or an amusement park. It tasted like it had a hint of lavender in it which sounds unappealing but actually was a nice touch. The cake was crisp and not really oily, another trademark of the amusement park funnel cake. The pot de creme was sweet and had a very strong butterscotch taste. The dessert combined together was really really good. We both agreed if we were ever in the area again, we’d definitely make it a point to come back to Terra. Very, very deserving of its Michelin rating.